Animals may vomit when something irritates, inflames or causes an infection in their intestinal tract. The location of the irritation, inflammation or infection may also determine the color of your pet's vomit and the reason for the upchucking. Many things can irritate, inflame or infect an animal's intestinal tract. Look around your home. There are toys, plants, foods, sharp objects, shoelaces, string, rubber bands, cleaning supplies, ant spray, rat poison, medications, vitamins, wasp spray, spot removers, parts, pieces, staples, soaps, sponges...and the list goes on. Other causes of irritation, infection and inflammation in an animal's intestinal tract that generate bleeding may have a genetic basis, be caused by parasites, a tumor, an ulceration or toxins. If you know your pet ate something out of the ordinary or unhealthy, then make that call and get your veterinarian involved before you do anything else. Your vet can guide you with the next steps to take. Your pet's vomit will be red, yellow or green. The color will help your veterinarian with treatment recommendations and drug therapy to calm and heal the intestinal tract. Vomit that is red is easy to remember. Think of the red as a "red flag" - an urgent warning like red lights at a railroad crossing or emergency vehicle. Red vomit demonstrates that there is active bleeding in the intestinal tract. Keep in mind that the blood may be varying shades of red and the color can run the range from red to black. If your pet's vomit has the appearance of coffee grounds something serious is going on in its body. Yellow vomit typically represents food that is regurgitated directly from the stomach area. It's in the early stages of the digestion process. If your pet's vomit is yellow and they have not eaten yellow foods or foods treated or prepared with yellow food coloring, their vomit is likely from the stomach area. Green vomit usually indicates that the food or substance was brought up from a location after the stomach. The addition of bile to the vomit substance will appear green or greenish. "If your pet vomits and looks ill in any way, there is blood or unusual objects in the vomit, see a veterinarian IMMEDIATELY," advises Jan Becker, DVM. 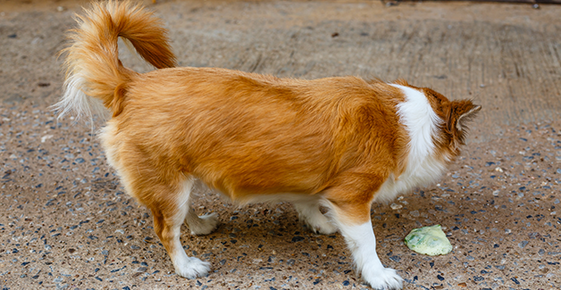 Dr. Becker further suggests in Dog or Cat Vomit: Green, Yellow and Blood Colored that pet owners not cut or reduce the length of any stringy material pets have ingested. The veterinarian may be able to extract the substance without a complete surgical procedure. String and stringy materials can tie up the intestines and create life threatening blockages. Call your veterinarian immediately and get your pet in for a consultation. Your vet will begin measures to restore balance and well being to your pet's intestinal tract. The information you provide will help your doctor know what occurred before you arrived at their office. Be alert and aware about your pet's habits. Keep your pet's environment free of dangerous or harmful objects and substances. Use paper towels to scoop up the vomit. Use a wet cloth or rag to pull upward from the carpet fibers. Pet store cleaning solutions and deodorizers can be added to ensure stain removal and removal of unpleasant fragrances. Prevent pet activity in the area until dry.